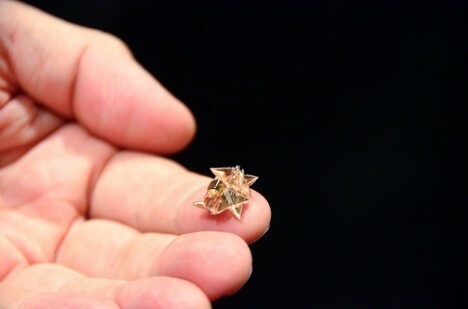 So tiny it can fit on the tip of your finger, this remarkably agile and multifunctional little bot assembles not only assembles itself but also goes on to dive underwater, carry objects twice its weight, burrows into the ground and then degrades on demand, leaving only a magnet in its wake. 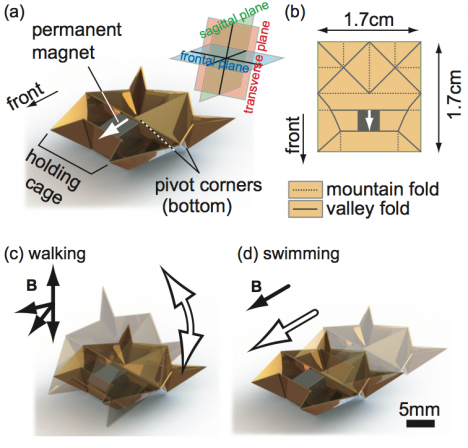 A just under two square centimeters, the Untethered Miniature Origami Robot is powered by a neodymium magnet and two pairs of electromagnetic coils that in turn create magnetic fields aiding the robot’s movements and transformations. Indeed, the magnet is not even dragging the robot around, but rather working with momentum and asymmetries to ‘walk’ the legs and create other actions from gravitational imbalances. As such devices become ever smaller, as well as increasingly programmable and autonomous, there are many potential applications, including ultra-small medical devices that can target cancer cells or clean clogged arteries within the human body. See more in Robotics or under Technology. June, 2015.